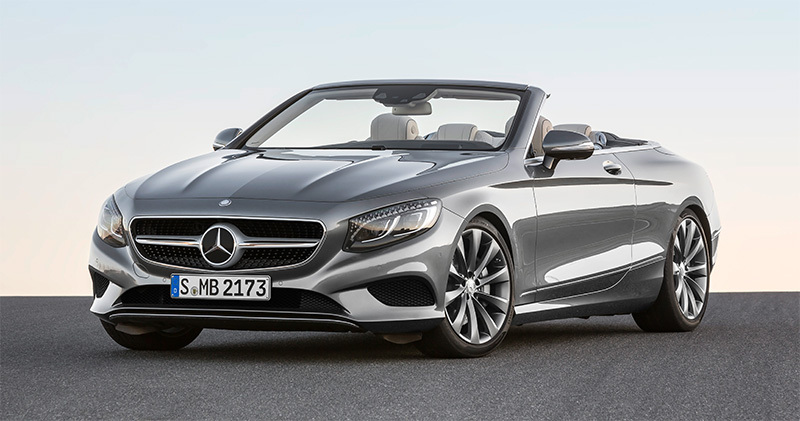 The new S-Class Cabriolet is the fourth variant of the current S-Class family in the U.S. market and the first open-top flagship four-seater from Mercedes-Benz since 1971. 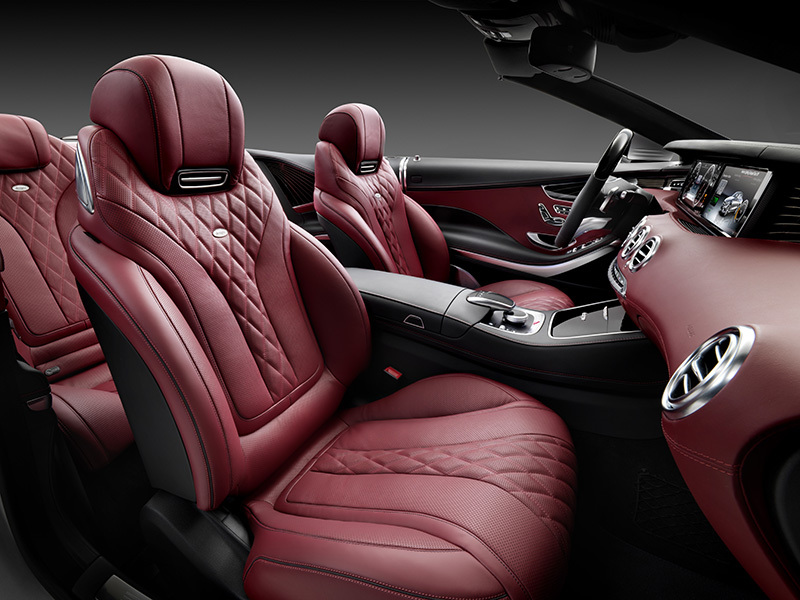 It offers a distinctive, sensual and exclusive design, the cutting-edge technology of the S-Class and a comprehensive warmth and wind protection concept which includes intelligent climate control for convertibles. The elegantly sporty model will have its world premiere at the Frankfurt International Motor Show in September. Also on display in Frankfurt will be a superlative dream car from Mercedes‑AMG in the guise of the S63 4MATIC Cabriolet. Its 5.5-liter V8 biturbo engine offers an output of 577 hp and peak torque of 664 lb-ft, AMG Performance 4MATIC all-wheel drive with rear-biased torque split as standard and acceleration from 0 to 60 mph in 3.9 seconds. The new S-Class Cabriolet is exceptionally rigid. Innovative solutions such as the luggage compartment bulkhead made of aluminium and magnesium as well as the aluminium rear floor also lower the bodyshell weight to the level of the S-Class Coupe. The standard-fit roll-over protection system behind the rear head restraints features pyrotechnic initiation of the actuators for the first time, in addition to the roll bars themselves which are moved into position by a gas generator. 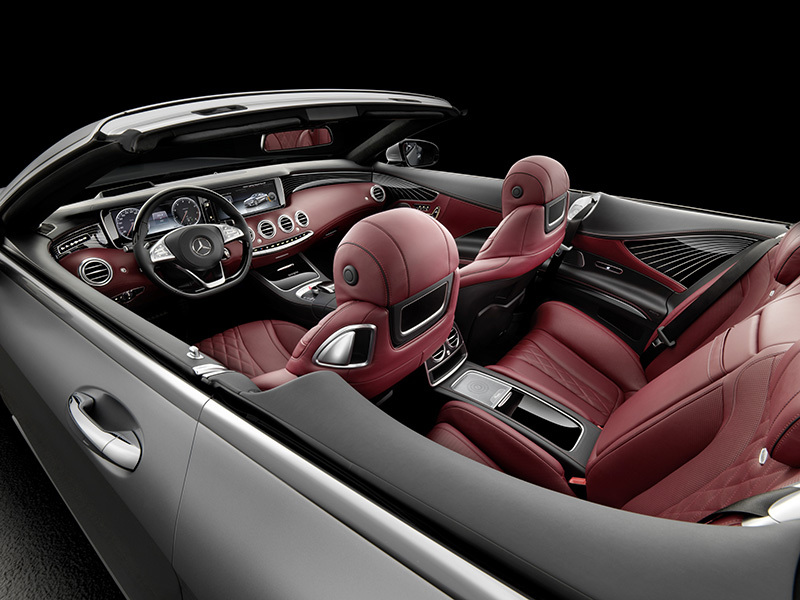 The new S-Class premieres an intelligent climate control system, which in the future will provide for ideal climate comfort coupled with maximum user-friendliness in all open-top vehicles from Mercedes-Benz. The air conditioning experts at Mercedes‑Benz developed a new software architecture specifically for this system, which underwent rigorous testing on state-of-the-art “hardware-in-the-loop” test stands prior to fine-tuning in the climate tunnel and on test drives. soft top influences air distribution, blower operation and temperature control. The new THERMOTRONIC with intelligent climate control follows the Mercedes-Benz philosophy of supplying cold air quickly after starting up the vehicle and subsequently controlling the climate as inconspicuously as possible. Like the S-Class Sedan and Coupe, the new Cabriolet is available with numerous new assistance systems that make driving even more comfortable and safer. Intelligent Drive systems include PRE-SAFE® Brake with pedestrian detection, DISTRONIC PLUS with Steering Assist, Brake Assist BAS PLUS with Cross‑Traffic Assist, Active Lane Keeping Assist, Adaptive Highbeam Assist Plus and Night View Assist Plus. In addition to a distance and collision warning function in conjunction with Adaptive Brake Assist, which offers collision protection from speeds as low as 5 mph, the standard COLLISION PREVENTION ASSIST PLUS system also features an additional function: when a danger of collision persists and the driver fails to respond, the system is able to carry out autonomous braking at speeds of up to 65 mph, thereby reducing the severity of collisions with slower or stopping vehicles. At speeds of up to 31 mph the system also brakes in response to stationary vehicles, and is able to prevent rear-end collisions at up to around 25 mph. The PRE-SAFE® preventive occupant protection system has been upgraded to PRE‑SAFE® PLUS. PRE-SAFE® PLUS can recognize an imminent rear-end collision and warn following traffic by flashing the rear hazard warning lights at a high frequency. When a danger of collision persists, the system can “lock” the brakes of the stationary vehicle prior to a rear-end collision and activate the PRE-SAFE® belt tensioners immediately before impact. This action minimizes the risk of whiplash injury by reducing the forward jolt caused by the impact and ensuring that the occupants are in the best possible position. As the sixth variant of the current S-Class worldwide and the fourth available in the U.S. market, the new S-Class Cabriolet (length/width/height: 197.9/74.7/55.8 inches or 5027/1899/1417 mm) is a member of the world’s largest luxury model family. 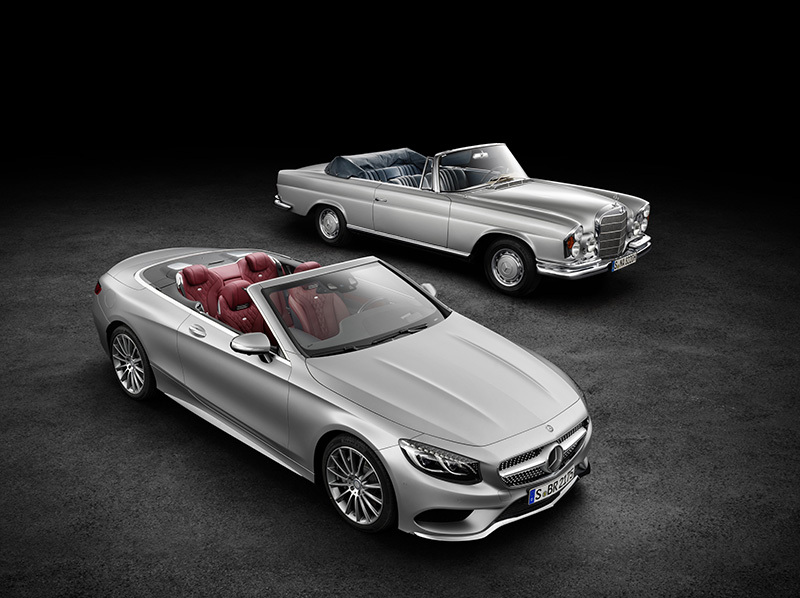 Its closest relative is the S-Class Coupe, from which the Cabriolet adopts around 60 percent of its bodyshell components. A completely new feature is the rear floor, produced in aluminium for the first time. This raises the share of this lightweight metal in terms of surface area to over 50 percent in the overall intelligent mix of materials. Striking new components are the longitudinal members in die-cast aluminium, based on a technology which was developed for the current SL. With the aid of a sand core, the longitudinal member is produced as a closed cast body which is hollow inside. This enables various components to be integrated in the longitudinal member, while also making varying wall thicknesses possible. This means a functionally ideal and weight-optimized design for the longitudinal member. In order to attain the high functional objectives (noise, vibration, durability and crash characteristics), the multifunction well (previously: spare wheel well) is welded in place in the bodyshell.